Connect a Linux computer to a pfSense firewall with an OpenVPN shared key tunnel. The OpenVPN tunnel allows communication with a remote client behind a firewall you don’t control. Scripts are also provided to allow the remote client to use the home network DNS when connected to the tunnel. I wanted a way for my Orange Pi backup server (post coming soon) to reach my home network without needing to alter anything in the office firewall. I also didn’t want to have to open up any ports on my home firewall for the backup server to reach my home network. The solution? A VPN tunnel between the offsite server and my home network using the pfSense firewall’s built in OpenVPN functionality. 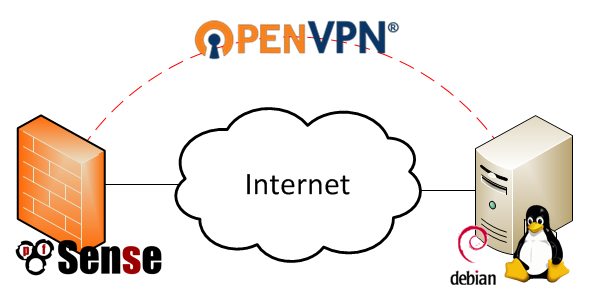 I decided to go with the most simple OpenVPN configuration which uses a static pre-shared key on each end of the connection to create a secure tunnel. You might see this configuration referred to as a “site-to-site” or “point-to-point” VPN elsewhere. OpenVPN documentation suggests that this configuration is less secure than the other possible OpenVPN configurations because it requires you to manually distribute the key securely, as well as compromises all past and future traffic if the key is compromised. I am fine with those trade-offs since I am more interested in obfuscation of the the traffic than security of the traffic. Configuring the pfSense side is pretty easy with the GUI. Navigate to your pfSense firewall and login as an administrator. The OpenVPN settings are under VPN->OpenVPN. I setup pfSense as the server in my case since it has a publicly resolvable DNS entry. I left all others default. Click Save to create the entry. Then click the e to edit the entry and grab the pfSense generated shared key. You will want to save this on the client under /etc/openvpn/. The Debian package is setup to automatically start OpenVPN as a service on system start. It also scans /etc/openvpn for .conf files which it will attempt to start upon the service starting. I take advantage of this behavior for my configuration. Instead of going through the learning process I went through, I’m going to walk you through my finished setup which consists of the following files. All of the files have had generic info inserted so as not to share identifying network information. The myvpn.conf file is the primary configuration file for the VPN tunnel. It includes information such as the remote host, the cipher type, and some settings related to keeping the tunnel alive and scripts to run up and down events for the tunnel. You’ll note that my remote setting is for a domain name. This points to my home Internet connection which has dynamic DNS running for the remote client to resolve. The other interesting settings in the file relate to the up and down scripts. I don’t use static IPs for my servers at home and instead rely on DHCP with dynamic DNS entries to my PFSense router. This means I don’t have to remember any IPs and can just remember the hostnames I give to all my virtual machines. This is great on the local network, but doesn’t help my mini backup server at all since it will be getting its DNS locally via DHCP. I created the up and down scripts to get around this. They basically work by copying in a different /etc/resolv.conf when the tunnel connects, and switching back to the DHCP entry when the tunnel goes down. This is the resolv.conf that is copied in by the up script myvpndns.sh. It has the domain and search entries set to the home domain, and uses the pfSense LAN address as the nameserver. The script to swap out resolv.conf is really simple. Copy the existing file to a .bak, then copy in /etc/openvpn/myhome.resolv.conf to replace the /etc/resolv.conf generated by dhclient. The restoredns.sh script simply moves back the original resolv.conf file. Then, you can check the state of the tunnel with ifconfig. The tunnel will probably show as tun0. You can see that the addresses correctly match the configuration file settings. Some pings will make sure that the tunnel is passing traffic. PING backup.homedomain.com (192.168.1.223) 56(84) bytes of data. Pinging my home backup server based on its hostname worked, which meant my script to swap out resolv.conf was working. I tested the setup by restarting both services a few times in either order, and also rebooted the machine. In all cases the DNS entries swapped out correctly. I do have one concern which may require further configuration, and that is persisting DNS across the dhclient renewal. If I run into issues, I will update this post with my workaround. I am very happy with how easy it was to setup OpenVPN and how flexible the configuration is. In the future, I’ll probably explore the other key setups available for OpenVPN, but the pre-shared key is working great for my use case. Here are some of the sources I used in generating my configuration.